A deft flick. An Ibrahimovic-style swivel and shot. A power header. A half-volley across the goalkeeper. A chip, an overhead kick and an edge of the box curler. Olivier Giroud’s pre-season goals have been impressive for the variety they have come in, indicating an improvement to the one part of his game that needed most work – his finishing. Last season, Giroud scored 11 goals (and 17 in all competitions) which is a fair return considering Arsenal shared its goals among the front four. Yet, digging deeper into the numbers and it shows that it could have been so much better. Those 11 goals Giroud scored in the league came at a conversion-rate of 10.3% – a poor return for any top striker considering 17-18% is believed to be par. (To put that into context, he had the worst efficiency of any striker who scored more than ten goals and the 10th lowest in the league, putting him alongside the likes of such esteemed company as Carlton Cole and Andy Carroll). To further compartmentalise his shooting, we can see just how erratic Giroud was inside the box. Last season, he took 64 shots from the central area (figure 1), scoring 9 times but those goals came only at a conversion rate of 14%; hardly an improvement from his overall figure of 10%. (As a comparison, Luis Suarez was just as uncouth as Giroud around the box but scored more goals: 23 at a conversion rate of 12%. But filtering those shots he took from the central areas of the box, and his conversion rate jumps to 26%). Where Giroud shoots from: As expected, the bulk of Giroud’s shots come from the middle of the box, but the statistics show him to wildly inconsistent. 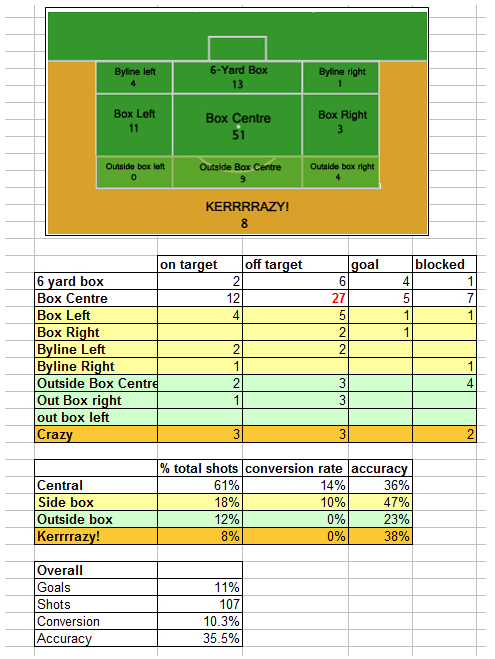 The key numbers are how often he fails to hit the target from the middle of the box (33/64) and his conversion rate from those areas (only 14%). Key: Goals – yellow, on-target – blue, off-target – red, blocked – grey (not all blocked shots recorded). In simple terms, it’s obvious that Giroud must show more composure to improve his finishing. That’s why his pre-season form has been so encouraging: his strikes have been of a wide variety. Indeed, after Giroud scored with a spin and a shot against Indonesia, even Wenger was unable to hide glee; it’s this type of dexterity that Giroud must show if he is to improve on his goalscoring record. Certainly, that’s one of the misconceptions about Giroud. To look at him, you wouldn’t associate him with good footwork but that’s what he specialises in, to varying success (which we’ll talk about more in depth later). When he was signed for the club, it was thought that he’d add another dimension to Arsenal’s attack and while he’s a viable Plan B, it’s his heading which has really let him down. We can see from the graphic below, courtesy of @11tegen11, that actually Giroud is not bad with his feet. Of course, a large number of his shots still find the stands but when he hits the target, he is great at finding the corners. However, when we superimpose those shots he takes with his head, he frequently hits it straight at the goalkeeper. This is bad because by not finding the corners, Giroud is limiting his chances of scoring by 40%. BUT, and there’s a big but here, the reason why Giroud’s headers are letting him down because often they’re from outside the 6-yard box. Studies by the authors of StatsBomb show that actually, headers have more chance of scoring than a normal shot because often they’re taken from closer to the goal. Giroud, though, frequently heads from outside the 6-yard box, either because his movement is not good enough or that Arsenal’s game doesn’t encourage headed shots therefore when he does, he often has to head from further back to get away from defenders. 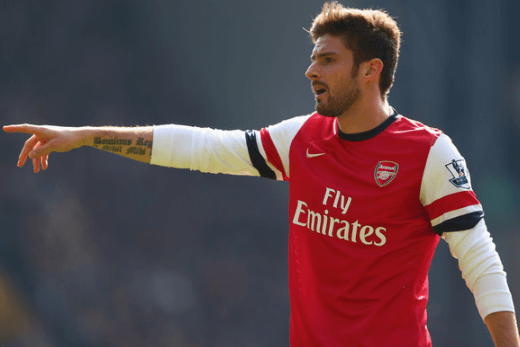 (The good thing about analysing Giroud’s shots is that it helps us learn the type of movement that Giroud makes. Typically, he likes to peel to the left side of the box so that he can open up his body to shot across goal or meet a low cross. When it comes from the right-hand side, the movement is again similar, however, he’s more reluctant to shoot with his feet. Instead, he’s a better threat from the air but if he does, he’ll often try and get in front of his marker and poke the ball towards goal). However, despite saying all this, there’s one statistic that stands out from the rest last season and that is that Giroud missed 19 clear-cut chances (which is basically a free attempt on goal with just the striker and the goalkeeper). It’s not made clear what proportion of those chances are headed or ground efforts but at least he’s with the type of company he could get used; because only Robin van Persie (23) missed more clear-cut chances than Giroud. At least he’s getting into the right positions….